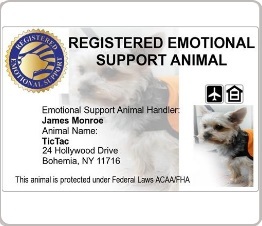 Identify Your Emotional Support Animal With A Vest, Certificate and Tag. Emotional Support Animals are typically dogs that provide comfort, support and affection to an individual suffering from varies mental and or emotional conditions. ESA’s are not required to have any special training, their sole purpose is to provide emotional and mental stability to their owner. Unlike Service Animals Emotional Support Animals are not required to have any formal training. An ESA should be well behaved in all public settings. An Emotional Support Animal must be prescribed by a mental health professional and renewed annually. The Fair Housing Amendments (FHAA) requires housing managers and landlords to accept you and your animal regardless of their no-pet policy. The Air Carrier Access Act (ACAA) allows emotional support animals to fly with their owner without being charged. Each carrier has different policies, please contact the airline you are flying on to request more information. 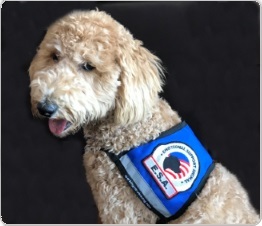 An Emotional Support Dog may need to wear an ESA vest to help identify him as an Emotional Support Animal. When you plan to travel with your Emotional Support Dog you should make sure he is wearing dog vest to limit public misunderstandings. 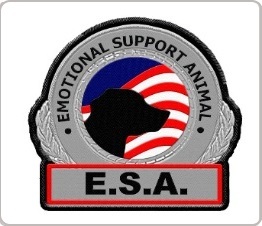 Our Emotional Support animal vests, kits and ESA certificates help members of the public understand that your dog is not only a pet, but also an Emotional Support Animal. Due to the Fair Housing Amendments Acts (FHAA) and Air Carrier Access Act (ACAA), our dog vests, emotional support animal certificates and ESA kits are incredibly important in identifying your animal as an Emotional Support Dog in public settings where pets are not usually allowed. 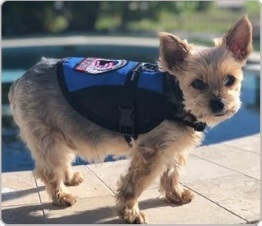 Emotional Support Animals come in all shapes and sizes, you can find an emotional support dog vest from WorkingServiceDog.com to fit any sized dog. These vests are high quality and comfortable for your dog to wear. Only the highest-quality materials are used; we are a direct to consumer manufacturer of all our service dog vests and animal support dog vests. Our ESA dog vests are available in durable padded materials that won’t hinder your dog’s movements or ability to assist you. We also offer Emotional Support dog vests in lightweight cotton materials as well as breathable mesh. Adjustable straps make it easy for dogs of any size to wear our Emotional support dog vests. We offer vests with ID Badge holders which make it easier to identify your E.S.A. All of our vests include at least one patch. We offer over 30 Emotional Support Animal and Service Dog patch choices. We are dedicated to offering products for any size emotional support dog. WorkingServiceDog.com offers emotional support dog certification. Although it is not a requirement to register an ESA many people are finding having an Emotional Support Animal certificate as well as other forms of ESA identification are less likely to have a confrontation In public places. Our ESA certificate is professionally printed and comes in a heavy stock personalized folder. 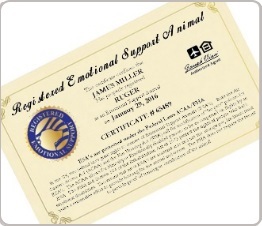 We also offer an Emotional Support Dog certificate in digital form. 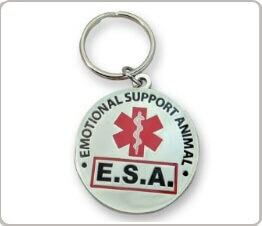 Registered Emotional Support Animal tags and ESA ID badges are also available. Our Emotional Support Animal ID Badges are customized the handlers information as well as an optional photo of your dog. The Emotional Support Dog tag is made of a heavy weight PVC. We offer Emotional Support Dog kits. Our products are discounted when combined in a ESA kit. 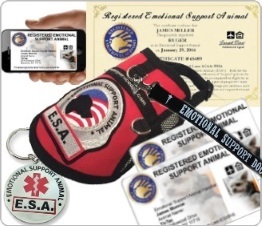 Our Premium Emotional Support Dog kit includes, a high quality emotional support dog vest, an ESA collar tag, two Emotional Support Animal ID cards that are customized with your animals information, an Emotional Support Dog certificate, digital ESA tags and an Emotional Support leash.